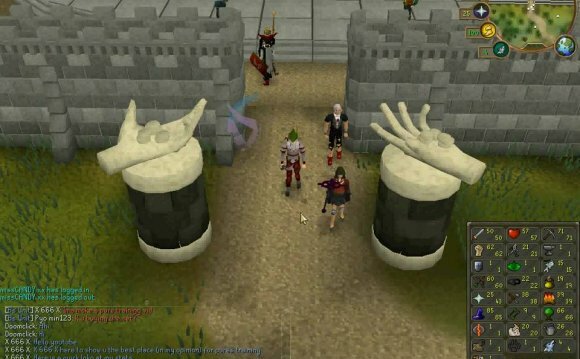 This article's aim is to teach the basics of successful Dungeoneering training that is not covered in the free-to-play guide. In it are described how to reset your progress, when to do so, the optimal sizes for dungeons and how best to approach each dungeon. A major recommendation for players is to choose private dungeons on a world that are completely unrelated to Dungeoneering to reduce the amount of lag in dungeons, which can prevent unnecessary deaths and therefore increase your average xp per hour. It is also important to note that due to the popularity of world 77 players will experience severe click-action delay, which, when fighting bosses such as Shadow Forger Ihlakizan, can prove fatal, and when fighting a very high level version of the boss can prove incessantly tiresome and repetitive. It is also very important to choose a world you are connected to nationally, for example someone from the US playing on a US world. This will decrease the probability of losing connection to the server from Router/network 'blips' and could also stop your teammates from looting your items, from you dying and from being trapped in an area where you can only die to get out. Dungeoneering does not require any additional skills to begin training. However, it does incorporate every skill in its mechanics, meaning that having overall higher levelled skills will better your Dungeoneering experience. Having many 99s will make you a welcome addition to any party, but isn't necessary to find a party or play solo. You should always be able to find people around your skill levels, if not on World 32, 77, or 117 then on the forums. The following skills are handy to have in almost any dungeon or party. Improving your skills will go a long way to improving your Dungeoneering, but is not necessary. Level 32 for the Create Gatestone spell and 64 for the Group Gatestone Teleport. These two spells are almost essential in dungeons, and it is recommended to get at least 64 mage before starting Dungeoneering. Herblore is needed for completing the odd skill doors/rooms. Bonus doors/rooms (not required to complete a dungeon) can have skill requirements that exceed the maximum skill level, thus requiring a potion to proceed. Herblore is also important when doing a door that your stats are near but need a boost in. The highest potion requires 99 Herblore, which is the Strong survivalist's potion. This allows the ability to catch higher level fish. The best, cave moray, is caught at level 90. Fishing, however, is NOT recommended unless you are with a team that prefers slower dungeons. One thing worth noting is that if you have an Aquarium and have unlocked the baitless Fly Fishing ability, it is fully functional in Daemonheim, speeding the process up significantly and saving inventory space. Fishing is required in completing the pondskater room and the Fish Ferret puzzle room. Minimises the burning of food. Level 90 is required for cave morays, but higher will prevent all of it from burning. Note that fires in Daemonheim are tiered by logs used, so using a gravecreeper fire will have a much lower chance of burning compared to a tangle gum one. Having a higher cooking level (at least 70+), will ensure that you will survive. Your Cooking level should be near or equal to your Fishing level for maximum efficiency. Cooking is also required in several rooms. The Shadow silk hood requires level 45. Higher defence allows for higher tiers of armour, tier 11 (boss drops) requiring 99. You will take a lot of damage while Dungeoneering as you will be attacked from high level monsters. Night spiders, keepers of the Shadow silk hood, require a Slayer level of 41. The higher your Slayer level, the more special monsters will become available in the dungeons, and therefore the more special drops that can be acquired. At 99, the Soulgazer can be killed, which drops the Hexhunter bow. This bow requires level 98 Ranged, and is considered useful in dispatching mages. The blood necklace is also considered a very valuable bind due to its offensive stats. 43 Prayer allows for the Protection prayers, which can be useful in Daemonheim. At higher levels, you also have access to Soul Split, which can heal significant amounts of health, and offensive prayers that speed up guardian doors.